West, Ian M. 2013. Geological Bibliography for Anvil Point to St. Aldhelm's Head and Durlston Head: Geology of the Wessex of England. Internet site: http://www.southampton.ac.uk/~imw/ald-bib.htm. Version: 13th December 2013. Durlston Country Park. Durlston Country Park is situated high on the cliffs on the south east corner of Purbeck. Within its 260 acres of unspoilt coastal grassland and limestone sea cliffs are a wide range of habitats, supporting an incredible wealth of wildlife, including many nationally important species. The Durlston Coastwatch Project is actively promoting marine research and understanding through involvement with the local community. Much of what is known about the wildlife and environment of the Durlston Marine Research Area is due to the dedicated volunteer team, the Friends of Durlston. [Unfortunately, the images on this site did not appear when visited on 29.01.01]. The Armin-Grewe Homepage - Durlston Country Park. Introduction with some photographs. Swanage and Portland Climbing Guide Book. More on the book referred to in the URL above. Climbing at Swanage. The Swanage cliffs stretch some 9 km., from St. Adhelms Head at the western end, to Durlston Head, above the town of Swanage itself. The Willerup Brothers. Climbing at Swanage. Rockfax - Dorset. Climbing information for Swanage and Portland, including technicalities and equipment needed. Logistic information for climbers in Dorset. Accomodation, tourist offices, camping etc. With maps of both the Swanage area and of Portland. Climbing in Dorset, UK. Some personal experiences of climbing on the Dorset cliffs, with photographs. Climbing - Swanage Cliffs Some photographs of climbers on the cliffs. Anderson. Location map of the coast between Durlston Head and St. Aldhelm's Head. Allison , R.J. 1986. Mass Movement and Coastal Cliff Development of the Isle of Purbeck. Unpublished Ph.D. Thesis, King's College, University of London. Allison, R.J. 1989. Rates and Mechanisms of Change in Hard Rock Coastal Cliffs. Zeitschrift Fur Geomorphologie, 73, 125-138. Allison,R.J. and Kimber, O.G. 1998. Modelling Failure Mechanisms to Explain Rock Slope Change Along the Isle of Purbeck Coast, UK. Earth Surface Processes and Landforms, 23 (8), 731-750. Annette , B.M. 1960. Limestone Climbs on the Dorset Coast. Southampton University Mountaineering Club, Second Edition, 36 pp. Annette, B.M. (undated). Limestone Climbs on the Dorset Coast. Published for the Southampton Mountaineering Club by Cade & Co. (Publications) Ltd. Third Edition, 52 pp. Price 6s. nett. Arkell , W.J. 1933a. The Jurassic System in Great Britain. Clarendon, Oxford, 681pp. Arkell, W.J. 1935. The Portland Beds of the Dorset mainland. Proceedings of the Geologists' Association, London, 46, 301-347. Arkell, W.J. 1947. The Geology of the Country around Weymouth, Swanage, Corfe and Lulworth. Memoir of the Geological Survey Great Britain, 386 pp. With Wright, C.W.and Melville, R.V. 2nd edition - 1952 with Addenda and Corrigenda. (the basic geological description of the area, although now old). Ballantyne , C.K. and Harris, C. 1994. The Periglaciation of Great Britain. Cambridge University Press, Cambridge, UK. BBC News Dorset, Online. 2012. Man dies after Swanage climbing accident. BBC news website: 24th August 2012. A 32-year-old man has died in hospital after a climbing accident on the Dorset coast. 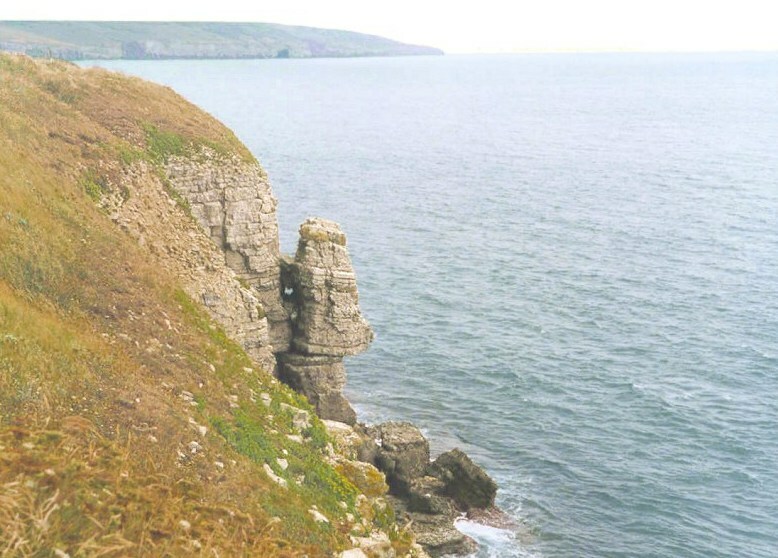 The experienced climber, who was with his girlfriend at the time, was scaling Dancing Ledge in Swanage on Thursday afternoon. Police said he was rescued from the sea and flown to Dorchester County Hospital by Portland Coastguard helicopter. But he was pronounced dead shortly after arrival. His next of kin have been informed. Benfield, E. 1990. Purbeck Shop. A Stoneworker's Story of Stone. Introduction by Brian Bugler. Ensign. By Eric Benfield. Bird , E. 1995. Geology and Scenery of Dorset . Ex Libris Press, Wiltshire, UK. Blake , J.F. 1880. On the Portland rocks of England. Quarterly Journal of the Geological Society, London, 36, 189-236. With notes and descriptions of Portland fossils and comparitive sections of the Portland rocks of England. By the Rev. J.F. Blake, M.A., F.G.S. Pp 190 -193 on the Isle of Portland (not highly detailed regarding the Isle of Portland but with information of Swindon, Vale of Wardour and elsewhere). Carter , R.W.G. 1988. Coastal Environments: An Introduction to the Physical, Ecological and Cultural Systems of Coastlines. Academic Press Ltd., London. Carter, R.W.G. and Woodroffe, C.D. 1994. Coastal Evolution: Late Quaternary Shoreline Morphodynamics. (Not specifically on this area but relevant). Coe , N. 1995. Swanage and Portland. Climbers' Club Guides. See also other editions. Cox , L.R. 1925. The fauna of the basal shell bed of the Portland Stone, Isle of Portland. Proceedings of the Dorset Natural History and Antiquarian Field Club, 41, 113-172. Cox, L.R. 1929-1930. A synopsis of the lamellibranchia and gastropoda of the Portland Beds of England. Proceedings of the Dorset Natural History and Antiquarian Field Club, 50, 131-202. Crewe , R.J. (ed.) 1977 revised edition. Dorset [Climbing Guide]. Edited by R.J. Crewe, Lulworth/Portland by the Rev. R.L.M. Shepton, Swanage by R.J.Crewe. Published by R.J. Crewe. 235 pp. See also a later edition by Coe, and there are earlier climbing guides for this region by Annette 1960 and undated. Davies , G.M. 1935. The Dorset Coast: A Geological Guide. Adam and Charles Black. London. Davies, G.M. 1956. The Dorset Coast: A Geological Guide. Adam and Charles Black. London. 2nd edition, 128 pages. Donovan , D.T. and Stride, A.H. 1961. An acoustic survey of the sea floor south of Dorset and its geological interpretation. Philosophical Transactions of the Royal Society, Series B, 244, 299-330. Englefield , Sir Henry. C., Bart. 1816. A Description of the Principal Picturesque Beauties, Antiquities and Geological Phoenomena of the Isle of Wight. With additional observations on the strata of the Island, and their continuation in the adjacent parts of Dorsetshire, by Thomas Webster Esq. Illustrated by maps and numerous engravings by W. and G. Cooke, from original drawings by Sir H. Englefield and T. Webster. Payne and Foss, 88 Pall-Mall, London. Printed by William Bulmer and Co. Cleveland-Row, St. James's. Fiennes C. (Celia). 1685-c.1712. The Illustrated Journeys of Celia Fiennes, 1685-c1712. Edited by Christopher Morris. MacDonald and Co., London and Sydney; Web and Bower, Exeter, England. Published in Great Britain in 1982. 248pp. ISBN 3456-08631-3. See also the 1888 edition of this work and the Cresset Press editions of Celia Fiennes, 1947 and 1949. The 1947 edition and the 1982 edition referred to here have the benefit of the editing by Christopher Morris. Celia Fiennes is from the manor house of Newton Toney, near Salisbury, and travelled around the country on horseback and wrote very informative descriptions of England at that time. Her original work was probably rather difficult to read because of problems of spelling and punctuation. The editing has made it easy and clear. As Dr. G.M. Trevelyan, Master of Trinity College, Cambridge stated, the edited version provides a correct text, an explanation of many obscurities both as to place names and other matters, and excellent explanatory notes. With the regard to the Dorset coast, Celia Fiennes discusses Brownsea Island, Kimmeridge oil shale, Swanage, Seacombe etc. There is also much on English spa wells, mineral waters, jet deposits, salt production at Lymington, a visit to the Isle of Wight etc. Francis , J.E. 1984. The seasonal environment of the Purbeck (Upper Jurassic) fossil forests. Palaeogeography, Palaeoclimatology, Palaeoecology, 48, 285-307. Silicified tree remains from Fisherman's Ledge. French , H.M. 1976. The Periglacial Environment. Longman, London, UK. (relevant background information, but not specifically on this area). Fursich , F.T., Palmer, T.J. and Goodyear, K.L. 1994. Growth and distintegration of bivalve-dominated patch reefs in the Upper Jurassic of southern England. Palaeontology, vol. 37, Part 1, pp 131-171. By Franz T. Fursich, Timothy J. Palmer and Kay L. Goodyear. Abstract: Patch reefs, up to 4 metres high and 8 metres across, grew amongst oolith shoals at the top of the Portland Limestone Formation (Portlandian, Upper Jurassic) on the Isle of Portland, southern England. Principal reef framebuilders, which provided between 55 and 70 per cent of the reef volume, were cementing bivalves, solenoporacean algae, and bryozoans. The remaining pore-space in the reef was filled by sediment, most of which is in the form of a precipitated peloidal cement. The cement lithified the reef while it was still exposed on the sea floor, and was probably precipitated under bacterial control. A diverse accessory fauna of small cementing encrusters and nestlers includes groups such as terebratulid brachiopods and lithistid sponges -that have not previously been found in the Portland Limestone. Serpula (Cycloserpula) striatissima sp. novo and Carterochaena pulcherrima gen. et sp. novo are described. Both the primary organic framework of the reef and the submarine cements were bored by a variety of endoliths, which locally removed as much as 40 per cent of the reef volume. Vacated borings acted as sites for precipitation of further peloidal cement. Borings are well preserved as natural three-dimensional casts in cases where they originally perforated an aragonite substrate which has since dissolved. New taxa of borings consist of Cunctichnus probans ichnogen. et ichnosp. nov., Spirichnus spiralis ichnogen. et ichnosp. nov., Talpina bromleyi ichnosp. nov., and Entobia cervicornis ichnosp. novo. Gaskell , A. Undated. The Isle of Purbeck: A Regional Study. The Tithe Barn Museum, Swanage. Goudie , A. and Brunsden, D. 1997. Classic Landforms of the East Dorset Coast. 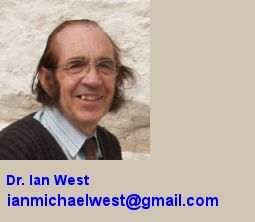 Published by the Geographical Association in conjunction with the British Geomorphological Research Group. Sheffield. 48 pp. Series Editors - Rodney Castleden and Christopher Green. Low cost paperback , pocket size booklet. Concise with excellent colour illustrations including good aerial photographs. Sections comprise: Introduction, the Portland Cliff, the Portland Raised Beach, the south Dorset coast, the Lulworth Coast, the east Purbeck coast, Studland Bay and the South Haven Peninsula, Poole Harbour, Glossary, Bibliography. (see also companion volume on West Dorset). Grabau , 1920. Textbook of Geology. Hardy, W.M. 1910. Old Swanage, or Purbeck Past and Present. A collection of Articles, topographical, historical, antiquarian, biographical and anecdotal. 264pp. By William Masters Hardy, Author of "Smuggling Days in Purbeck", etc. New and revised Edition with three supplementary chapters. Twenty-eight full-page illustrations, including reproductions of rare prints. Entered at Stationers' Hall. Price (original) three shillings and six pence, net. Dorchester; "Dorset County Chronicle" Printing Works. The Author's Preface - extracts only. .... My reward will be that I have done something to visualise for the information and, I hope, the entertainment of generations yet unborn the "Old Swanage" which I have loved, which having been born in, I have always esteemed the most desirable place of abode in all the world, and where I hope, in the good time of Providence, to end my days." Haysom , D. and Bragg, D. Swanage and Purbeck in Old Photographs. Alan Sutton Publishing Ltd., UK, 160 pp. Jones , M.E., Allison, R.J. and Gilligan, J. 1984. On the relationship between geology and coastal landforms in central southern England. Proceedings of the Dorset Natural History and Archaeological Society, 105, 107-118. Latter , M.P. 1926. The petrography of the Portland Sand of Dorset. Proceedings of the Geologists' Association, London, 37, 73-91. Legg , R. 1984. Guide to Purbeck Coast and Shipwreck. Dorset Publishing Company, Milborne Port, Sherborne, Dorset, DT9 5HJ. 96 pp. ISBN 0 90212958 9. [Well illustrated account of the topography, history and shipwrecks of the coast. Interesting old photographs and maps. 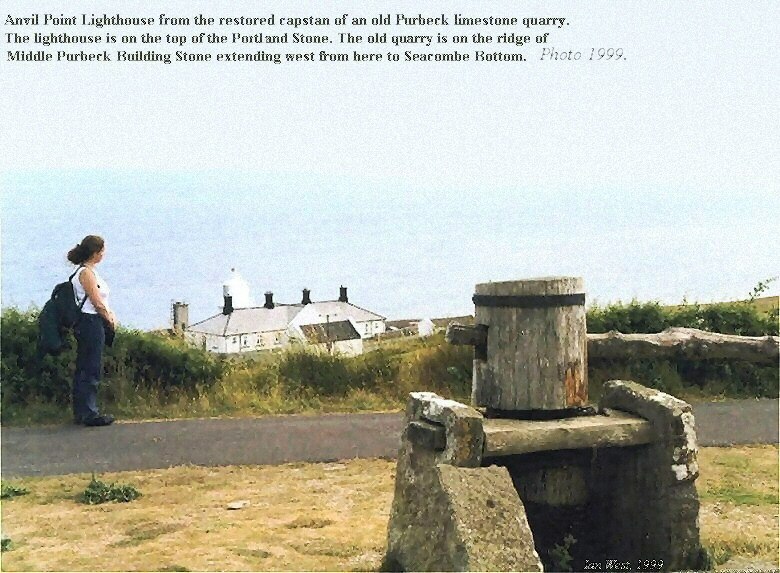 Includes various interesting historic records regarding the south coast of the Isle of Purbeck. Shipwreck of the Alexandrovna, or Alexandrovnia, 1182, on the Ragged Rocks, west of Anvil Point, with a reference to a crew of 77.
and many other topics, some of which have geological interest. Back cover information on the author: "Rodney Legg has been collecting the minutiae of Purbeck history since he was twelve. He has walked every path in this superb corner of Dorset, some at night as well as day, and has talked with fishermen, quarrymen and farmers. He has accumulated a vast store of information that is now unsurpassed by any individual and much of the material in this book is from his personal archive. Rodney Legg has shared his enthusiasm for Purbeck, publishing Purbeck Island in 1972 and Purbeck Walks and Old Swanage in 1983, as well as numerous articles over the years in his own Dorset County Magazine which he founded in 1968. In this Guide to Purbeck Coast and Shipwreck he gives a story, often with pathos or tragedy, to every rock-pool between Kimmeridge and Studland. Each location is approached logically rather than alphabetically, much as you would on the ground, in a general amble from west to east. A fifteen mile sweep of coast is covered, with sufficient detailed diversions to deter anyone who is dismissive enough about Dorset to feel he can 'do' it in a day's walk. Apart from his series of Purbeck studies, Rodney Legg has achieved a national archaeological reputation for his work with John Fowles in transcribing the two massive volumes of John Aubrey's Monumenta Britannica as well as his own books on the Romans in Britain (Heinemann) and the Stonehenge Antiquaries." Legg, R. 1989. Purbeck Island; The Industrial, Social and Natural History of a Corner of England. 230pp. Paperback book. Dorset Publishing Company, at the Wincanton Press, National School, North Street, Wincanton, Somerset, BA9 9AT. Second, revised edition of a book first published in 1972. Legg, R. 2006. Discovering Lost Dorset; a personal view through magic latern photographs and other images of the County in the Author's Unique Collection. Dorset Books, 160 pp. Lewer , D. 1986. The Story of Swanage: A History from Early Times. A Harewood Publications Visitors' Guide. 33 pp. Harewood Publications, 8 Harewood Place, Bournemouth, BH7 6NU. �2.-25p. in 1999. ISBN 0 906596 03 3. (Available in Swanage bookshops). See particularly pages 14-15 - "Quarrying the stone". North , F.J. 1930. Limestones: their Origins, Distribution, and Uses. Thomas Murby and Co., Fleet Lane, London. 467pp. Prestwich , J. 1892. The raised beaches and 'Head' or rubble-drift, of the south of England; their relation to the valley drifts and to the Glacial Period; and on a late post-Glacial submergence. Quarterly Journal of the Geological Society, London, 48, 263-343. Robinson, C.E. 1882. A Royal Warren or Picturesque Rambles in the Isle of Purbeck. By C.E. Robinson, M.A., Barrister-at-Law, Author of the "Cruise of the Widgeon;" "The Golden Hind, Thessale, and Other Poems," etc. The etchings by Alfred Dawson. London, The Typographic Etching Company, 23 Farringdon Street, EC. 1882. "A Royal Warren"-The words by themselves may perhaps fail to convey the meaning, which renders a seemingly whimsical title really descriptive of the work now before the reader. It should therefore be explained at the outset that the "Isle of Purbeck" -no island in point of fact, but an isolated promontory - was originally, like the New Forest, a wild hunting-ground of our Norman, and probably even Saxon kings. Disafforested so far back as the reign of Henry III, it became thenceforward merely a "Warren of Conies" [a Rabbit Warren]; but the spirit of the antiquated forest laws remained, to hamper the cultivation and improvement of this beautiful district, long purposely secluded from the outer world. To the former operation of these laws the quaint, half-mediaeval character of the island, even at the present day, is in great part due. The first requisite of a forest, or warren, is that it should be always kept in a wild, half-peopled, untilled state; and in such a condition for ages were successive kings able to keep the Isle of Purbeck, much assisted by the barriers of heath, hill, and water, which divide it from the rest of Dorsetshire, and by the influence they could wield from the royal castle of Corfe. Hence the old-world aspect of the villages, mansions, and churches, scattered over a country of great natural beauty, which has yet suffered little at the hands of the railway "navvy," the "jerry" builder, or the modern agriculturist. Grand sights in Purbeck may be few, the massive ruins of Corfe Castle and the magnificent coast scenery notwithstanding; but, on the other hand, it is a perfect storehouse of picturesque subjects on a smaller scale. This has been recognised by distinguished artists long before now. Turner visited and worked in the island; the late E. W. Cooke, R.A., left several drawings of Purbeck views behind him; and Mr. Seymour Haden has etched many charming subjects there. It is the lead of such pioneers as these that the Author has endeavoured with his pen and the Artist with his pencil to follow, in the course of the rambles described in this volume. The fruit of their joint labour is neither a county history, a diary of travel, nor a guide-book (though it shares the nature of all three), but a series of pen-and-pencil sketches of the picturesque element in Purbeck, and any special value it may possess is owing to the fact that most of the materials for the letterpress, as well as the plates and cuts, were gathered at one and the same time, in the heart of the country depicted, and thus may be said thoroughly to illustrate one another. 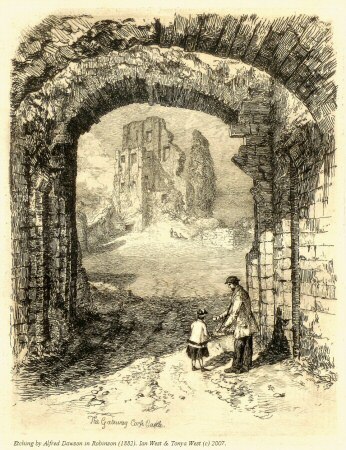 Although the first place has throughout been given to the picturesque, many pages have been reserved for whatever is of greatest interest in the historical, topographical, or antiquarian lore relating to the locality; and here the author must acknowledge his indebtedness to the Purbeck section of that well-known book, Hutchins's History of Dorset (Ed. 1861), which was almost entirely rewritten by Mr. Thomas Bond, M.A., J.P., of Tyneham House (a member of one of the oldest and most respected families in the district), and constitutes a model in its department of research. References to it are frequently made in this volume, as also to the monographs by the same author, entitled respectively, "The Ancient Manor Houses" and" The Ancient Families of Purbeck." Recourse has also been had to that interesting work of the Right Hon. George Bankes, M.P., The Story of Corfe Castle (published by John Murray, 1853); and to several other books not peculiarly of local interest. To Mr. A. M. Luckham are owed some notes referring to Studland. Nor has natural history been entirely disregarded. The author has been enabled, by the kindness of Mr. R. H. Soden Smith, of the South Kensington Museum; to add an interesting note on the land-molluscs of Purbeck; and is indebted to Mr. Henry Willett for a communication of the results of his recent exploration in Durleston Bay, Swanage, and rediscovery of remains of the rare fossil mammal, Triconodon mordax. This information may all be regarded as supplementary to that contained in the county-history, Hutchins's Dorset, and the author himself has been able to bring forward fresh matter in the descriptions of scenery, generally, throughout the book; and particularly in the accounts of Swanage and Studland, of the wrecks of the Wild Wave and other vessels, of the stone quarries, and Tilly Whim, and of antiquities found at Swanage and elsewhere. The work will, therefore, it is hoped, be considered of local interest; while, in describing the picturesque features of such a thoroughgoing bit of old England as Purbeck still remains, the author trusts also to gain the ear and suffrage of the general public. It is proper to mention that the ten large plates, and smaller etchings or cuts, from the hand of Mr. A. Dawson (son of the well-known landscape painter, the late Mr. Henry Dawson of Nottingham) are all new, and all original (except the map, and two geological sections, and the cut of the guardship at South-haven, which is from a sketch by the Author). Some of the large views are copper-plate artists' etchings of the old type, executed by the well-known process of drawing with a needle on copper, through a blackened varnish, or "ground," and then obtaining incised lines by applying acids, in solution, to the uncovered parts of the copper. The others are produced by a method in some respects novel, to which the name "photograving" may conveniently be applied. An ordinary photographic negative is taken from the artist's drawing, which is then impressed by the action of light on the gelatinous substance, portions of which being subsequently dissolved away, the remainder present a delicate relief mould. From this mould an electrotype in copper is taken, which forms the face of the finished plate. The effect aimed at is that of copper mezzotint. These plates, as well as the etchings, are printed tn a roller press. The small cuts are practically etchings, until they leave the artists' hands, for they are so far executed in the same manner, but through a white prepared ground on brass plates. Here, however, the resemblance is at an end, since no acid is used, but all the parts of the drawing which are intended to be white in the impression, are raised by adding wax, and the whole is then electrotyped in copper, so that the lines, instead of being incised, are in relief. After the electrotype has been backed with lead and mounted on a block of wood, these blocks can be printed exactly as ordinary woodcuts, along with the letter-types of the book-printer. This process, invented by Mr. A. Dawson, is the subject of a patent, and is known as "Typograph�c Etching." It is as well adapted for fine picturesque work as for reproducing mechanical drawings, for which purpose it has been greatly used; and being, as compared with wood cutting, inexpensive, yet equally lasting, has no doubt an important future. 16 Old Square, Lincoln's Inn, 9th January 1882. Strahan , A. 1898. The Geology of the Isle of Purbeck and Weymouth. Memoirs of the Geological Survey, England and Wales. London. 278pp. Published by Order of the Lords Commissioners and Her Majesty's Treasury. Price 10 shillings and 6 pence. Printed for Her Majesty's Stationery Office, by Wyman and Sons, Limited, Fetter Lane, EC. With coloured map, cross-sections and a bibliography of books, papers and maps by W. Whitaker, F.R.S. (1761-1873) and by A. Strahan, M.A. (1874-1898). Townson , W.G. 1971. Facies Analysis of the Portland Beds. Unpublished. D.Phil. thesis, Oxford University. 284 pp. By William Geoffrey Townson (Geoff. Townson). Supervised by Dr. A. Hallam. Thesis presented to the University of Oxford for the Degree of Doctor of Philosophy. Facies Analysis of the Portland Beds. A descriptions and interpreted environmental history of the Portland Group in England and Northern France with particular emphasis on the exposures in Dorset. By William Geoffrey Townson, B.Sc., A.K.C., F.G.S. New College and Department of Geology and Mineralogy, Oxford, England. Oxford, August 1971. The Portland Group, previously known as the Portland Beds, is the highest division of the regressive marine Jurassic sucession in England. The strata are well exposed on the coast of Dorset and Bas Boulonnais of North-east France and poorer exposures occur in Wiltshire, Oxfordshire and Buckinghamshire. The rocks are also known from boreholes in Hampshire, Surrey, Sussex and Kent. This thesis comprises a facies analysis of the Portland Group using stratigraphical, sedimentological and palaeoecological data. In spite of being familiar to most geologists, if only in name, these rocks are suprisingly poorly documented and there was ample scope for a detailed study of the sediments. Because refined correlation by fossils had not been established a regional approach is used and the successions in each area are described and interpreted in turn. Correlations are suggested between the widely separated areas using phases of regression and transgression, supplemented by ammonite evidence as much as possible. The thickest sections exposed are in Dorset where the sequence reaches nearly 80m. This area provides the basis for description and interpretation of the areas where the successions are thinner, reaching a maximum of 6m in the far north-eastern outcrop in Buckingshire. The Portland Group in Dorset is divided into the Portland Sand Formation overlain by the Portland Limestone Formation, described in separate chapters. The Portland Sand Formation is an upward continuation of the sandy and silty development in the Upper Kimmeridge Clay. The sediments are dolomitic and the highest beds are virtually pure fine grained dolomite which is interpreted as having been formed in relatively deep water. An environmental model for the deposition of the Portland Sand Formation is discussed. The Portland Limestone Formation follows this dolomite and sponge-rich, fine-grainedd cherty limestone pass up into high energy biocalcarenites and oolites. These are overlain by non-marine hypersaline to brackish, Purbeck Beds. The Portland Group in Dorset is regarded as having been laid down during three phases of shallowing of the sea. These can be recognised throughout the basin of deposition and are regarded as being essentially synchronous; the ammonite distribution supports this interpretation. Within the Dorset area there wasa swell, or region of minimum subsidence, separating a minor West Basin from a major East Basin which extends to south Hampshire. The thickest succession of the Portland Group is probably between the Isle of Purbeck and the Isle of Wight. The water was shallower over this swell than in the basins and, as the sea level fell, this local difference in depth had a considerable effect on the pattern of sedimentation. The description and interpretation of the influence of the swell on the carbonate facies of the Portland Limestone Formation is a major part of this thesis. The nearest exposure to Dorset is in the Vale of Wardour to the north where the succession is nearly half the thickness. Despite poor exposure, the sediments have been studied in detail and a correlation between this area and Dorset is given. The Vale of Wardour was nearer to land in the west with the result that the terrigenous sediments occur at higher [lower?] horizons than in Dorset. In the South Midlands, the succession is even thinner, very glauconitic in places and there is a break near the base which represents approximately 100m of sediment in Dorset. The thinness and presence of terrigenous material almost throughout indicates that these were also deposited marginally. The change to non-marine conditions is thought to have occurred earlier in the Vale of Wardour and the South Midlands than in the Dorset Basin. The Portland Group is exposed on the coast near Boulogne and there the succession is similar to that in the south Midlands. Land was nearby and clay, quartz and silt and sand predominate throughout, and at one horizon there is a conglomerate of Palaeozoic pebbles. The change to non-marine conditions probably took place earlier than in Dorset. In South-east England the borehole evidence is not very satisfactory and only generalisations can be made. There is a gradatin from the Kimmeridge Clay, as in Dorset, and it is supposed that the lowest Purbeck Beds were deposited at the same time as the highest levels of the Portland Limestone Formation in Dorset, thus eliminating the necessity for a break as has been suggested. The fauna of the Portland Group is mollusc dominated. The rarity of brachiopods, corals, echinoids, and the absence of belemnites and crinoids is thought to be due to a slight increase in salinity at times. Another controlling factor was the energy of the environment. Soft lime muds deposited in quiet water eliminated epifaunal bivalves and mobile carbonate sands were virtual deserts. The presence of Palaeozoic pebbles in the Boulonnais and South Midlands indicates land not far to the north and east, whereas the heavy mineral assemblages of Dorset suggest a source in an Armorican area to the west. Thus the Portland Group Basin was mostly enclosed by land but there was a connection to the north-east, south and possibly south-west during uppermost Kimmeridge Clay times. As the regression continued probably only the connection with the Paris Basin continued. The history of depositiosn in the Portland Basin is one of shallowing which eventually restricted both the circulation of the sea and the life within it. This culminated in hypersalinity and deposition of evaporites, except where rivers brought in fresh water. Judging frm the presence of cycads, rare corals, thick shelled bivalves and the precipitation of evaporites, the climate was probably sub-tropical throughout Portland Group times and the change from terrigenous to carbonate deposition upward in Dorset was due to a move from deposition in a clastic trap on to a carbonate shelf, rather than a major climatic change. Townson, W.G. 1974. Geology of Coombe Valley; remapped after investigation of a gas-main trench dug in October 1969. [near Chalbury and Bincombe Hill, north of Weymouth, Dorset.] Proceedings of Dorset Natural History and Archaeological Society, for 1973, published in July, 1974, vol. 95, pp. 7-8. Short paper. The Jurassic and Lower Cretaceous rocks in Dorset were laid down conformably but were folded and faulted before further deposition during the Upper Cretaceous period. In the Tertiary the strata were folded and faulted again and some of the pre-Albian high-angle faults were re-orientated to have the appearance of thrusts. Detailed information of this is given in Arkell (1947) together with an admirable map which illustrates these features on the scale of three inches to one mile (Arkell, 1947, Pl. XIX). Townson, W.G. 1975. Lithostratigraphy and deposition of the type Portlandian. Journal of the Geological Society, London, vol. 131, pp. 619-638, 5 figures. Key paper for the Portland strata, with good diagrams. Available online in the Lyell Collection of the Geological Society of London. By William Geoffrey Townson (now a retired petroleum geologist, Dorset geologist and geological artist). The "Portland Beds" of Dorset (Portlandian of English usage) are described in terms of a Group comprising two Formations and seven Members. Facies and thickness variations indicate the presence of a swell separating an East from a West Basin. The swell may be due to the movement of Triassic salt [a thick sequence of Triassic salt has since been proven under the Isle of Portland]. The environmental history of the Portland Group is described in terms of three cycles consisting of a major regressive and minor transgressive phases superimposed on an overall regression. The lower cycle consists of siliciclastics and dolomite deposited in a relatively deep marine environment. The dolomite formed by in situ replacement of lime mud. The middle cycle consists of cherty fine-grained limestones deposited on the outer part of a carbonate shelf. The abundance of replaced sponge spicules adequately accounts for the amount of chert. The upper cycle consists of cherty limestones passing up into shallow water grainstones. Ooid shoals developed over the swell. These marine limestones are overlain by stromatolites and evaporites which formed on the basin margin. Townson, W.G. 1975. Information for a Geological Field Excursion to Dorset. Field Guide, A4 size. 2nd Edition (Revised). Shell U.K. Exploration and Production Limited. 83 pp. Townson, W.G. 1976. Discussion of Portlandian faunas. Journal of the Geological Society, London, 132, 335-336. Webster, T. 1826. Observations on the Purbeck and Portland Beds. Transactions of the Geological Society, London , 2, 37-44. West, I.M. 1964a. Evaporite diagenesis in the Lower Purbeck Beds of Dorset. Proceedings of Yorkshire Geological Society, 34, 315-330. [Petrographic evidence of vanished evaporites in the Caps and Broken Beds - pseudomorphs, celestite, lutecite etc. Diagenetic history established.] Abstract: Five stages have been determined in the diagenetic history of the calcium sulphate beds of Lower Purbeck age in Dorset, particularly by reference to abundant pseudomorphs and other relict textures and structures preserved in late-formed gypsum and in secondary silica and calcite. The weight of the overburden is thought to have controlled the changes. Occurrences are described of minerals, including celestite, calciostrontianite, lutecite and quartz remaining after the removal in solution of gypsum. A description is also given of secondary limestones which occur particularly in the Caps and Broken Beds. They are shown to be almost entirely replacements of original sulphate deposits. [End of abstract]. Below are shown lenticular pseudomorphs after gypsum of the type described in this paper. West, I.M. 1969. Contribution in International Field Symposium on the British Jurassic; Guide for Dorset and South Somerset. Ed. H.S. Torrens, A60-61. West, I.M. 1965. Macrocell structure and enterolithic veins in British Purbeck gypsum and anhydrite. Proceedings of the Yorkshire Geological Society, 35, 47-58. Abstract: A nodular structure, here termed "macrocell structure" [nodular or chicken-wire structure] , is commonly associated with enterolithic veins in the British Purbeck gypsum and anhydrite. The veins and macrocell structure preceded the brecciation that gave rise to the Broken Beds and were present in early secondary anhydrite. Both structures probably originated when primary gypsum was undergoing compaction before the lithification of the associated marl, and have not resulted from hydration of anhydrite. 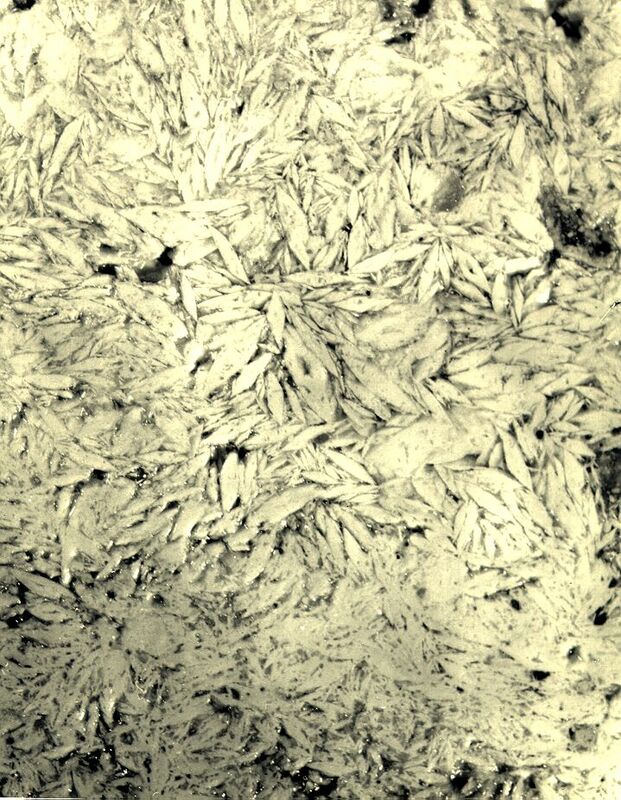 A sequence of diagenesis for Purbeck calcium sulphate with macrocell structure is established, comparable to that previously elaborated [West, 1964a] for the calcium sulphate with [the microscopic] net-texture. Similar features are present in other calcium sulphate deposits. West, I.M. 1974. Evaporite diagenesis in the Lower Purbeck Beds of Dorset. Reprinted in Kirkland and Evans (Ed. ): Marine Evaporites, Origin, Diagenesis and Geochemistry. Benchmark Papers in Geology. [See West, 1964] Abstract: Five stages have been determined in the diagenetic history of the calcium sulphate beds of Lower Purbeck age in Dorset, particularly by reference to abundant pseudomorphs and other relict textures and structures preserved in late-formed gypsum and in secondary silica and calcite. The weight of the overburden is thought to have controlled the changes. Occurrences are described of minerals, including celestite, calciostrontianite, lutecite and quartz remaining after the removal in solution of gypsum. A description is also given of secondary limestones which occur particularly in the Caps and Broken Beds. They are shown to be almost entirely replacements of original sulphate deposits. West, I.M. 1975. Evaporites and associated sediments of the basal Purbeck Formation (Upper Jurassic) of Dorset. Proceedings of the Geologists' Association, London, 86, 205-225. Abstract: Four facies of limestones, each with particular contents of calcitised evaporites and of skeletal debris were recognised. They are compared with sediments of modern evaporite-depositing environments. 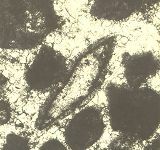 The lowermost limestones, stromatolitic and pelletoid with foraminifera, probably originated in intertidal to shallow subtidal, moderately hypersaline, water. Overlying pelletoid limestones with algal-mats and some gypsum are products of high-intertidal flats. The main evaporite beds were originally gypsum, probably formed in supratidal to intertidal, very hypersaline, palaeoenvironments. The gypsum was converted to anhydrite and later brecciated in part, forming the Broken Beds. Extensive calcitisation produced porous unfossiliferous limestones. Ostracodal limestones above probably originated in shallow, only moderately hypersaline water. All the basal Purbeck strata were formed in and around a large shallow gulf with extensive tidal flats and with water of varying but predominantly high salinities. At times of uplift, thin soils developed on the former margins of the gulf. Forests were able to exist there because, although the area was within the semi-arid zone, it was probably very near to the boundary of the warm-temperate zone. End of Abstract. [Additional notes on topics discussed: Palaeosalinity origins of the basal Purbeck facies and lateral correlation. Mostly hypersaline to varying extents, including the stromatolite horizons. Fossil trees 'pickled' in a salt lake. Details of the basal Purbeck strata at all the main localities, studied petrographically. Depositional environments of the dirt beds and marls. Palaeoenvironmental significance of sedimentary cyles. Thickness variations of the facies. Relationship of the Broken Beds to the evaporitic facies. Local uplift. Penecontemporaneous fault movement. The Mupe Bay oil sand.] Some diagrams that are based on this paper are given below. Wimbledon, W.A. 1976. The Portland Beds of Wiltshire. Wiltshire Archaeological and Natural History Magazine, 71, 3-11. Wimbledon , W.A. 1987. Rhythmic sedimentation in the Late Jurassic-Early Cretaceous. Proceedings of the Dorset Natural History and Archaeological Society, 108 for 1986, 127-133. Most of this paper is on the Portland Group. 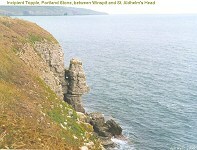 An Appendix refers to Purbeck nomenclature. Abstract: A number of shallowing and deepening phases is described in the late Kimmeridgian - Berriasian interval. Eleven deepening / transgressive events are noted in the most complete Dorset section. A preferred lithostratigraphy for these beds is compared to previous lithostratigraphy, and "event correlations" are critically examined. Wimbledon, W.A. and Cope, J.C.W. 1978. The ammonite faunas of the English Portland Beds and the zones of the Portlandian Stage. Journal of the Geological Society, London 135, 183-190. The first scheme of zones for the Portlandian Stage of the Upper Jurassic was proposed by Salfeld (1913) but has suffered because some of the index species used were of dubious interpretation, and it was based on sections in the S Midlands now known to be incomplete. Salfeld's zonal table was succeeded by Buckman's hemeral scheme. 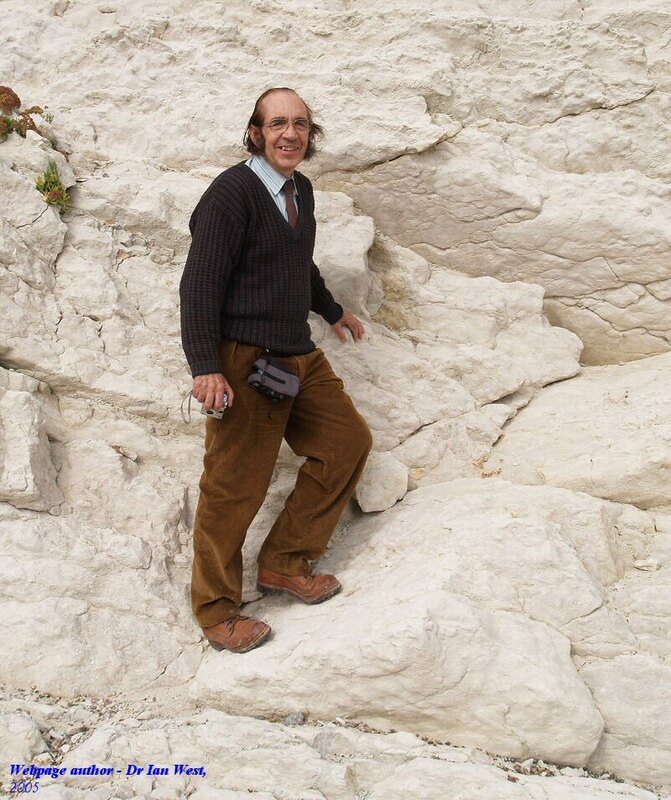 Buckman was the first person to attempt any really detailed stratigraphical work on the Portland Beds, and he obtained, from quarries in the Thame district ammonites which were described half a century ago in 'Type Ammonites' under a multiplicity of new generic and specific names. Although Buckman's hemeral scheme has long since been abandoned, his work is a very useful record of the faunal succession in an area where there are now few exposures. Comparison with sections further south has shown that his records are essentially correct as far as recording of horizons is concerned. Where his work failed, and also that of subsequent workers, was in the correlation of the south Midland successions with those of the Dorset coast. This was due to the persistent acceptance of certain widespread misconceptions concerning the ammonites and their stratigraphic relationships, a lack of systematic collecting, and a consequent inability to establish the ranges of the faunal assemblages. Recent work on the Portland Beds throughout their outcrop by the authors, but with emphasis on the presumed complete successions in Dorset, has shown how wrong some of the former correlations were, and although work has not yet reached completion (when a joint monogtaphic work is contemplated) sufficient is now known to set up a revised zonal scheme. The work on the faunas of the Portland Stone, the subjacent rocks north of Dorset, and the systematic palaeontology, is by Wimbledon. This has been integrated with Cope's work on the Portland Sand in Dorset. The genus Progalbanites Spath 1933 appears to be quite distinct from the earlier Volgian genus Zaraiskites with which it has long been confused (see Casey 1967, p. 132). The type species of the genus, P. albani, is frequently common, and is associated with hitherto undescribed species of the genus. The remainder of the ammonite fauna includes species of Epivirgatites including E. nikitini (Mich.), E. vulgaris (Spath) and others. There are also undescribed species of Pavlovia. Amongst the pavloviids are occasional fragments of forms apparently close to the subgenus Epipallasiceras Spath (see Buckman 1926, pI. 693). [continues for 10 pages, including three large photographic plates of ammonites. Wimbledon, W.A., Allen, P., Parker, A., Ogg, J., Algeo, T., Hunt, C.O. and Nunn, J. in preparation 1997. The Kimmeridge-Wealden transition in the Portland, Lulworth and Swanage districts; the Portland-Purbeck type sections - their stratigraphy, palynology, clay mineralogy, heavy minerals and palaeomagnetism. Wimbledon, W.A. and Hunt, C.O. 1983. The Portland - Purbeck junction (Portlandian - Berriasian) in the Weald, and the correlation of latest Jurassic - early Cretaceous rocks in southern England. Geological Magazine, 120, 267-280. Woodward , H.B.1895. The Jurassic Rocks of Britain. Vol 5. The Middle and Upper Oolitic Rocks of England (Yorkshire excepted). Memoirs of the Geological Survey of the United Kingdom. 499pp. Dorset Scenery - Dancing Ledge, Autumn. 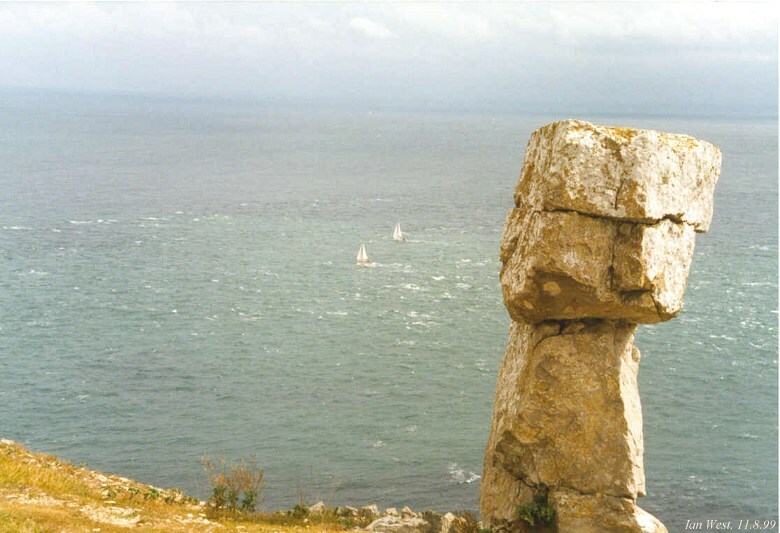 - Dancing Ledge is a disused stone quarry located right at the sea's edge on the Purbeck coast. The Purbeck stone extracted from this quarry would be loaded into barges brought in close to the cliffs at high tide, then shipped along the coast to the various destination ports. The photographs shown here follow a typical outing to the ledge on a breezy day at the beginning of October. Starting at the small hamlet of Acton (SY 990 785) the route follows the Priest's Way briefly then descends southwards over the fields to Dancing Ledge (SY 998 769). 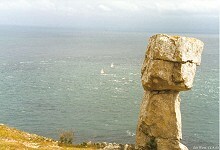 The return route follows the coastal path westwards for a short distance, before ascending onto the Purbecks once more. - Set of 10 photographs. Copyright © 2013 Ian West, Catherine West, Tonya Loades and Joanna Bentley. All rights reserved. This is a purely academic website and images and text may not be copied for publication or for use on other webpages or for any commercial activity. A reasonable number of images and some text may be used for non-commercial academic purposes, including field trip handouts, lectures, student projects, dissertations etc, providing source is acknowledged.